Kay is a Master Saddler, qualified Saddle Fitter and former President of The Society of Master Saddlers. In 1967 Kay started to learn her trade at the London firm of Bliss and Co. Although the company is long gone now, it had saddle and bridle manufacturing departments and their goods were of the highest quality, setting the precedent for Kay’s career. In 1970 Kay took the step to start her own business, mainly making bridlework for both retail and wholesale customers. By this time, Kay had my own horse and competed in most disciplines within the Riding Club movement, taking part in the National Championships at show jumping, eventing and prix caprilli, even competing in the Riding clubs Quadrille final at the Horse of the Year Show. Whilst building up her riding portfolio Kay competed up to Grade A level in show jumping. Kay’s own riding experience gave her an enhanced understanding of the expectation of both horse and rider and how the fit of a saddle could affect the horse’s way of going. In the 70/80’s there was nowhere to learn saddle fitting- it wasn’t seen as a separate skill and knowledge was a bit thin on the ground, so it was a bit ‘see if that works’. As a true horsewoman Kay was able to understand what worked and didn’t in terms of the horses comfort, which enabled her to design and advise on changes to the design of saddles over the years. After moving to Scotland from Wiltshire Kay set up her business as Kay Hastilow Master Saddler Ltd in 1994 and quickly built up a formidable reputation. When setting up in Scotland, Kay focused on saddle fitting and saddle design, as being a Master saddler and a rider she found that she could bridge the gap that sometimes exists between rider and saddle maker. 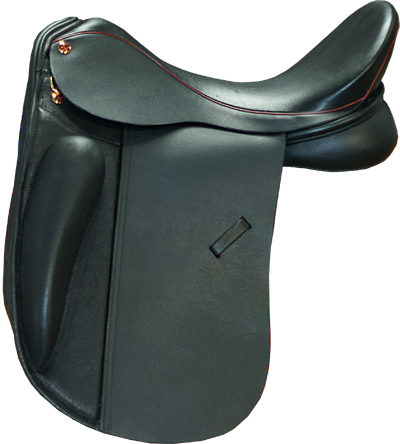 For Kay, position, security and comfort of the rider and comfort and fit for the horse are her priorities which led to the development of Kay’s own ‘Kintbury’ saddle. Many design features now common place came into being at Kay's behest, and she still is involved in design work on saddles for several manufacturers. New models are tested out by Kay on her own horses. When The Society of Master saddlers started the Qualified Saddle Fitter's courses and qualifications in 1994 Kay was asked to be involved both as lecturer and in compiling the course notes and has held the position of Senior Lecturer for the past 20 years. Kay was asked to be the President of the Society of Master Saddlers, a position which she held for a number of years. In recent years Kay has hung up her full time saddle fitting boots and now concentrates on imparting her wealth of knowledge to around the world to fellow professionals, prospective saddle fitters, vets and physiotherapists. In 2017 Kay launched her first online learning series. When not busy working Kay still resides in Scotland with her husband and her horses and still enjoys a day out on horseback. Copyright October 2017. All Rights reserved.